Anthracnose may significantly decrease biomass yield of switchgrass. Research explores tolerance of cultivars to Colletotrichum navitas. Anthracnose (caused by Colletotrichum navitas) may negatively impact biomass yield of switchgrass (Panicum virgatum L.), often grown for bioenergy purposes. Consequently, evaluating cultivar and accession response to anthracnose is crucial for maximizing production efficiency and developing cultivars with improved disease tolerance. Research from the study reported below found a significant range in tolerance levels to anthracnose with certain cultivars having lower amounts of anthracnose (e.g. High Tide and Timber) compared to other entries (e.g Falcon and PI 442535 from Belgium). Further research is needed to confirm the response of these cultivars in a diverse range of environmental conditions. Switchgrass (Panicum virgatum L.) growing in Freehold, NJ. Photo: L.Hoffman. 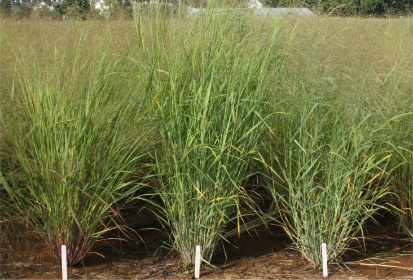 Over the past decade, research has focused on the identification of novel germplasm and the development of improved switchgrass (Panicum virgatum L.) cultivars to meet biofuel, bioproduct, and ecosystem service markets. Targeted breeding has resulted in significant gains in biomass yield for both lowland and upland ecotypes along with the inclusion of additional traits such as increased vigor and seed size (Casler, 2012). Research has also classified a number of different diseases and insect pests that may result in decreased switchgrass biomass yields. Anthracnose (caused by Colletotrichum navitas) is one disease that has the potential to cause significant reductions in plant biomass; however, limited research exists on the overall impact or control of this disease in switchgrass production. Anthracnose is a general term used to describe a group of fungal diseases that affect a wide variety of plants worldwide. Until recently, anthracnose on switchgrass was thought to be caused by Colletotrichum graminicola, which affects many cereal crops including maize (Zea mays L.) and wheat (Triticum spp.). Crouch et al. (2009), however, isolated and identified a novel Colletotrichum species unique to switchgrass that was appropriately named Colletotrichum navitas, where ‘navitas’ means energy in Latin. To date, anthracnose has been detected on switchgrass plants growing in Pennsylvania (Sanderson, 2008), New York (Waxman and Bergstrom, 2011), and New Jersey (Crouch et al., 2009). In addition to the Northeast United States, anthracnose has also been observed in major switchgrass production areas such as Iowa (Gravert and Munkvold, 2002). A major concern associated with anthracnose infection is the potential for significant reductions in biomass yield caused by the disease. In the warm-season bioenergy crop sorghum (Sorghum bicolor L., Moench), anthracnose (caused by Colletotrichum sublineolum) has been shown to cause biomass yield losses ranging from 20-40% (Pande et al., 2003). This suggests that anthracnose may be a significant problem in switchgrass cultivation in the United States, but research is needed to fully understand the impact C. navitas will have on overall biomass production and yield. Symptoms of anthracnose first appear as chlorotic tissue (foliar blight) on leaf blades followed by the development of acervuli (asexual fruiting bodies) that produce conidia (spores). Infection centers on the leaf may coalesce to form large irregularly shaped areas that occupy the entire leaf blade along with stem tissue. Overall, a reduction in green, photosynthetically active tissue can result in decreases in biomass yield along with potential impact on the composition of biomass. Anthracnose (caused by Colletotrichum navitas) on a switchgrass leaf blade. Photo: L.Hoffman. As with other Colletotrichum spp., it is thought that C. navitas overwinters on soil and decaying plant residue, which serves as the primary innoculum source. Conidia production is triggered by increases in temperature and humidity, conditions that are also conducive for plant infection. The conidia are disseminated via wind and rain resulting in infection of leaves or stems on the same or neighboring plants. Along with temperature and humidity, there are several plant factors that can influence the level of damage caused by anthracnose. For example, plants experiencing multiple stresses at one time (i.e. drought and nutrient deficiencies) are more susceptible to anthracnose compared to healthy plants. In addition, limited research suggests that tolerance to anthracnose differs among switchgrass ecotypes and cultivars; however, the response is not well known the across a wide variety of germplasm. In 2008, 24 switchgrass cultivars and accessions were established at the Rutgers University Plant Biology Research and Extension Farm in Freehold, NJ (Table 1). The major objective of this study was to determine whether plants differed in their tolerance levels to anthracnose caused by natural epidemics of Colletotrichum navitas. Switchgrass plants were visually evaluated on July 23, 2012 and August 20, 2013 for percent disease (0-100%). Differences in anthracnose tolerance were detected among the cultivars and accessions evaluated with disease ratings ranging from approximately 15 – 85% in 2012 and 18 – 89% in 2013 (Table 1). In both years, the upland cultivar High Tide exhibited significantly lower amounts of anthracnose (15.0% in 2012 and 17.9% in 2013) compared to several of the other cultivars and accessions evaluated. The lowland cultivars Timber, Alamo, and Kanlow also exhibited better tolerance compared to most of the other entries. An upland accession from Belgium (PI 442535) was one of the least tolerant entries of the study with disease ratings of 84.9% in 2012 and 87.5% in 2013. 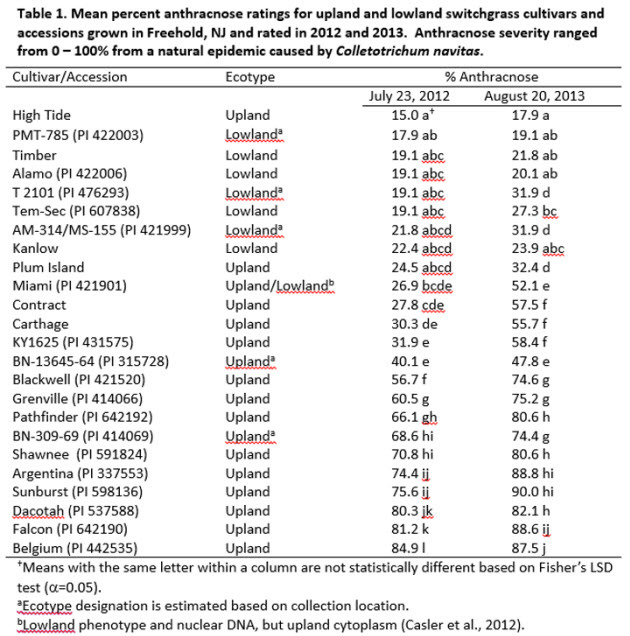 In addition, an upland ecotype from Argentina, and the upland cultivars, Shawnee, Sunburst, Dacotah and Falcon also had significantly more anthracnose compared to over half of the entries. Shawnee is a cultivar that generally has good adaptation and competitive biomass yields in the Northeast, so this is somewhat troublesome. Overall, it is interesting to note that the lowland cultivars tended to have more tolerance to anthracnose than upland cultivars, which is similar to the findings of Hoffman et al. (2016). Altogether, this research provides necessary information on the susceptibility and resistance levels of switchgrass cultivars and selections to anthracnose. This information can be used to guide cultivar choices for planting in the Northeast and aid breeding efforts towards the development of new cultivars with enhanced disease resistance. Additional research is needed, however, to confirm the tolerance levels of the entries evaluated across a wide variety of environmental and climatic conditions. Gravert, C.E. and Munkvold, G.P. 2002. Fungi and diseases associated with cultivated switchgrass in Iowa. Journal of the Iowa Academy of Science 109:30-34. Waxman, K.D. and G.C. Bergstrom. 2011. First report of anthracnose caused by Colletotrichum navitas on switchgrass in New York. Plant Disease 95:1032. DOI: 10.1094/PDIS-03-11-0164. Lindsey Hoffman1, Laura M. Chaves2, Hilary S. Mayton3, Eric Weibel1, Stacy A. Bonos1. 3 Center for Teaching Excellence, Garden Avenue Extension, Cornell University, Ithaca, NY 14853. The Northeast Woody/Warm-season Biomass Consortium – NEWBio is supported by the Agriculture and Food Research Initiative. This material is based upon work that is supported by the National Institute of Food and Agriculture, U.S. Department of Agriculture, under award number 2012-68005-19703. Next PostNext What Generation Is Your Biodiesel?